They'll expand the motion-sensing area of a system and help with night views. The Arlo Security Light provides a welcome expansion to one of our favorite smart home security products, Arlo’s Wi-Fi home security cameras. We tested the $250 two-pack. You can also buy a single-light system ($150 at Amazon) or a three-pack ($350 at Amazon). The lights operate on battery power and contain their own motion sensors, so they can run independently of Arlo cameras to form a stand-alone motion-sensitive lighting system. But the real strength of the lights comes when you program them to interact with your Arlo cameras. Using the app, you can program other Arlo lights and cameras (with the exception of the Arlo Go series of cameras, which communicate via LTE, not Wi-Fi) to react when a motion detector on any other Arlo device is triggered. The lights can be programmed to remain lit for 5, 10, 20, 30, or 60 minutes after being triggered. You can program Arlo devices to interact with each other. The motion sensor in a light, for example, can trigger a camera to record video. If a light is set up in a different position to the camera, for example, or facing in a slightly different direction, the light effectively increases the area that the camera can otherwise cover using its night vision. Set up one light at the far end of a pathway, and another closer to a camera, and you can program the camera to capture video as soon as the motion sensor on the farther light is triggered, so you get an early recording of someone approaching your house. The motion sensors in Arlo cameras can also trigger the lights, and you can have any device in the system sound the alarm in the Arlo base station when that device detects motion. To the right you’ll see an example of what it looks like in the app. If the motion detector on my second light is triggered, the system switches on a camera and the other light, even if those other devices didn’t detect motion themselves. This is pretty useful. In other smart home security systems, the individual units usually work alone, tied together in a central app but unable to influence each other. If you've ever used If This Then That (IFTTT) to tie together smart home devices, this will be instantly familiar. It works in a very similar way and might be the source of Arlo's inspiration for the system. Each Arlo Light produces 400 lumens of light, which will provide a bit of illumination to supplement the infrared night vision on Arlo cameras. That’s a little more than the 300 to 350 lumens put out by devices in the Ring Spotlight Cam range, but it’s much less than the 1,800 lumens of the Ring Floodlight Cam or the 2,400 lumens of the Maximus Camera Floodlight. If you want to illuminate a large area, you’ll need a bigger fixture that’s hardwired to AC power, as those latter camera/light combos are. In addition to the motion sensing, the lights can be switched on manually through the app, but you can't program them to come on at dusk and off at dawn or at any programmed times. As they're battey powered, you'll want them on as little as possible to frequent recharging and battery swaps. One fun little feature that sets the Arlo Security Light apart from most other outdoor smart lights is the ability to program the color of their LEDs. 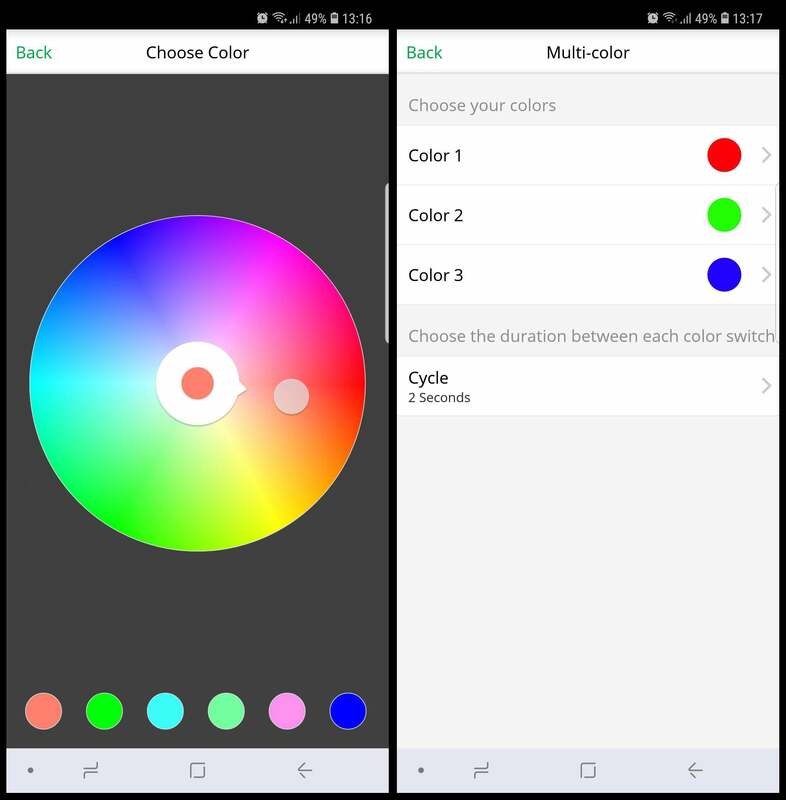 You can choose from millions of colors on a color wheel, and you can even set them to flash on and off or cycle between three different colors. This, and the ability to dim the light, can be useful while you’re entertaining guests outdoors. Unlike most outdoor floodlights, the Arlo Security Light is equipped with color LEDs. One necessary element of the Arlo Security Light is a plug-in bridge that sits between the lights and your Wi-Fi network. It’s needed because the lights communicate via Bluetooth Low Energy to save power. The bridge handles the connection between Bluetooth and your Wi-Fi network. 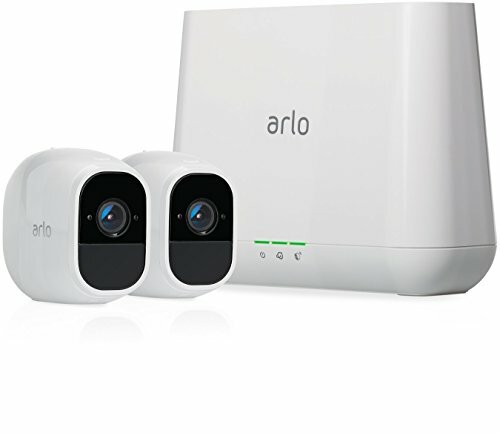 Arlo uses a similar strategy for its Wi-Fi security cameras, but those devices employ a proprietary wireless protocol to communicate with a base station, which then connects to your Wi-Fi network. Arlo camera base stations don’t have a Bluetooth radio onboard. I hope Arlo rectifies that with a subsequent version of the base station, so everything can connect to a single piece of equipment. Arlo recommends connecting no more than four lights per bridge but you can have an unlimited number of bridges and they don't count towards any device totals on Arlo subscription accounts. The Arlo Security Light carries an IP65 rating, which means it is entirely protected from dust incursion and that it can withstand water jets from up to a 6.3mm nozzle from any direction. The light can operate in temperatures ranging from minus 14 degrees Fahrenheit to 113 F (minus 10 degrees Celsius to 45 C). There’s a 1/4-inch threaded mount on the bottom of the light, like that used for most security and photographic cameras. The two-camera kit reviewed here comes with two mounts. Arlo Pro 2 cameras have a similar mount, but they also have a magnetic mount, which makes them easy to put up and aim. That option isn’t available with the Arlo light. Arlo lights use the same rechargeable battery as the Arlo Pro 2 video cameras. That interoperability is a plus, because you can swap batteries between the products, use the same in-home dual-battery charging station (optional, $60 at Amazon), or just keep a single charged spare battery (also optional, $50 at Amazon) on hand for when any one of them runs out. The cameras have proven to be top performers when it comes to battery life, lasting several months between recharges, and it looks as though the lights are similarly frugal about power consumption. Arlo Security Lights are a good addition to an Arlo camera system, helping provide some light during nighttime and expanding the cameras' detection area. It’s great that Arlo made it possible for the lights and cameras to trigger each other. It would be better if the lights worked with the existing Arlo base station, rather than requiring their own bridge, but at least the bridge is included in the purchase price of every kit. As stand-alone lights, they do a sufficient job, but if you’re not going to use them with Arlo cameras, you'd likely be better off buying standard home security lights. They’ll be much brighter even if they can’t send alerts to your smartphone. This story, "Arlo Security Light review: These battery-powered, multi-colored LED lights are good companions for Arlo cameras" was originally published by TechHive.